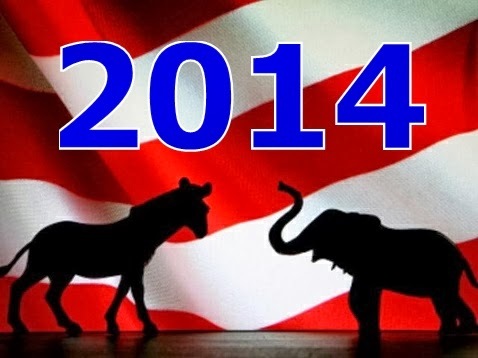 Two very respected pollsters seem to see the 2014 electorate through very different lenses. The resulting picture of what to expect in the 2014 mid-term elections couldn't be any muddier. If you think about it, all the ingredients necessary for a political explosion are in place: Congress's unfavorable ratings are at record-high levels, and, according to Gallup, its favorable ratings are down to 9 percent (who knew members had so many friends and family?). A large segment of the electorate is furious with Republicans over the shutdown, and a second group is boiling over about Obamacare (or as the White House once again calls it, the Affordable Care Act), with some of that group angry at the substance of the law and some at the launch debacle. Gallup's weekly presidential job-approval ratings for Nov. 11-17 had President Obama's approval at just 41 percent. And to add a cherry on top, an obscure House member (Florida Republican Trey Radel) has pleaded guilty to cocaine possession. You would think that all of this would add up to a highly combustible political situation. Wave elections are very real, but they are very party-specific. A large partisan wave is highly unlikely in 2014, because voters hate Democrats in Congress while simultaneously despising Republicans. To vote against one party, people have to vote for another in very large numbers, which at this point seems unlikely. Democrats might want to consider opening their minds to the potential of another midterm nightmare. I remember dozens of conversations with GOP candidates and strategists prior to the 2012 elections. Republicans simply couldn’t wrap their minds around the possibility that 2008 could ever be repeated. That failure in comprehension contributed to inaccurate polling and wrong assumptions as the two electorates ended up being remarkably similar. Now, I’m starting to feel a sense of deja vu when talking with Democrats. Anytime 2010 comes up in a conversation, it is quickly dismissed as an aberration. Most Democrats can’t even imagine another election cycle where President Barack Obama is as unpopular and as much of a drag on Democrats as he was in his first midterm. More troubling for Democrats is the evidence that Democrats could be vulnerable in places and races that should not be competitive unless there is an electoral wave. In a recently released Quinnipiac University poll in Colorado, Democratic Sen. Mark Udall polled in the mid-40s against a handful of underwhelming and unknown Republicans. This is in a race currently rated by the Rothenberg Political Report as Safe for Democrats. We don’t have comparable public data for too many other supposedly safe Senate races, but there are at least 10 other Democratic Senate seats that are structurally more vulnerable than Colorado. Of course, as I’ve written before, Republicans only need to win states that Mitt Romney carried in 2012 to get back to the Senate majority. There's no consensus early line on what might happen in 2014. At this point all I can suggest is get a good ringside seat, it's going to be an interesting bout.